"Sometimes things aren't supposed to change," Billy would say, lying in bed while rubbing my back, when we got to talking about the town, about how unfortunate it all was, how opportunity had gone to waste. "I guess they do whether they're supposed to or not," I said. I'd have my eyes closed and one of my ears to his chest, and I'd feel him move his arms and hear the flick of a lighter. Usually he'd get one solid puff before I took the cigarette from him, warning him that it was bad and that I didn't want him to smoke. He'd just laugh. Then he'd cup one of my breasts and we'd both close our eyes to fall asleep. That's when I would remember. There was debate about it at first – some understandable reluctance – but the developers were ultimately welcomed with open arms and clenched teeth. After all, even though Jesse owned more than half of the land at the time and thus had stake in much of the real estate, it was still our town and we didn't want any outside developers coming in to build strip malls, which would attract every shopper within 100 miles and clog up our town with traffic every day of the week. But after Jesse told everyone he was selling all his land and moving to Florida, it seemed inevitable. "It's my damn land," he told everyone at the town meeting in the courthouse, "I'll do what I damn well please." Before he said that, though, he'd tried to explain and then had to rationalize his actions for what seemed like an hour. No one was having it. "But what happens when we get a Wal-Mart? What about Home Depot? They'll drive me outta business!" shouted Ed Connors, who owned a small hardware shop called Benny's Hardware. Newcomers to town – though far and few between – eventually got around to asking why the store was called Benny's, and Ed had to tell them that was the previous owner's name. Ed used to be Benny's apprentice, my father told me once. "Now trust me on this," said Jesse calmly, "you have my word that none of the megastores'll move in, okay? They'll just be outlets, all right?" "What kinda outlets?" asked Ed. His tone was one of disbelief, even accusation. Other than the collared shirt and black jeans – a uniform, sort of, since he always wore it during work hours – he was usually sporting a baseball cap that looked like it could be blown off his head by the slightest gust of wind. It was difficult to imagine him running, so I always thought if something like that happened, then he'd just shrug and watch it tumble down the street, or across the yard, or wherever he would be at the time. He was always making corny, hardware-related jokes, too, although I can't remember any of them. "Now just calm down," said Jesse, who was holding up his hands like he was being held at gunpoint. "That's up to the clients, but the contract specifies that places like Wal-Mart, Home Depot, K-Mart, Target, and stores like that can't move in. I made sure – before I signed everything over – that the contract specified that, so we wouldn't run into this. Even though I'm leaving for Florida soon, I want the best for this place. After all, you're all still my friends." There was an awkward, scattered round of applause, which inadvertently signaled the end of the meeting. Whether anyone else had anything else to add or not, Jesse was done talking, and wasn't going to get up again. I secretly thought of bringing up the town's next order of business – getting rid of our newly appointed black sheriff. I decided not to bring it up at all, though, as I figured no one had seen Blazing Saddles and not one of them had Johnson for a last name. In other words, none of them would've gotten the joke. Bobby – the first boy I'd ever kissed – made me watch that movie with him in his parent's basement one day while they were at work. He thought it was hilarious, but I found it mostly sophomoric and juvenile. I was also kind of nervous, too, since we were both supposed to be in school. Come to find out, another one of the stipulations – my English teacher said I have the best vocabulary out of the whole senior class – was that only the townsfolk were allowed to open businesses in the strip mall, which kept outsiders from moving in in the first place. Why Jesse hadn't mentioned that during the meeting, my father commented one evening during supper, was a mystery. Perhaps he wanted us to think better of him in his absence. I'm sure once Ed Connors found out about that, he felt bad about his outburst. Jesse and him had been friends for a long time, and Ed had no reason to believe that Jesse had anything but the best in mind for our town. "So how'd Jesse come to own everything?" I asked my father the day after the town meeting, at breakfast. Between bites of toast, my father explained, "Well, Jesse inherited everything – the land, the real estate, everything – from his father. How his father got all that I don't know. It never came up, and I never brought it up." My father and Jesse weren't friends exactly – more like acquaintances. Everyone in town knew each other to a certain degree, even if they didn't care to. Months later, in the spring, construction crews raced into our town as if they were going to build a whole city, or conversely, raze one. Even though most of the townsfolk thought the outsiders would clutter our streets and make things more difficult for everybody, the construction workers stayed out of trouble and boosted our local economy, buying food, gas, cigarettes, and other items from the lone gas station. Despite many of the older folks disparaging the new development whenever an opportunity presented itself, the construction went smoothly and was finished by the summer. As quickly as they'd arrived, however, the workers fled our town like freed prisoners who all at once remembered how it felt to be free, how invigorating. "I don't care that he has the money," my father told me at the lunch table one afternoon following the completion. "It's a stupid idea. It's just stupid. He's gonna lose all that money – I'll bet on it." Father was talking with his mouth full of turkey sandwich that I'd fixed him. Since mother passed, I'd done all the cooking, which left me with no time for boyfriends – at least that's what I told the boys to save face. Really, father wouldn't let me date. I was all he had left he told me again and again. "What else is going in?" I asked. "Connors wants to open a shop – a baseball shop. He said he's gonna call it 'Just Baseballs,' if he's able to get a loan. They're idiots, I tell ya. The only thing he said he's gonna sell is baseballs. I said, 'What about bats? Mitts?' He said, 'Nope – just baseballs,' and then laughed. Well, that's a surefire way to lose his house and his hardware shop. And then, get this, Latter wants to open a store, too. Know what he's gonna sell?" I paused, not knowing if he was waiting for a response. "I don't know?" I said, unsure of myself. "Ladders. Latter wants to sell ladders. And you know what he's gonna call his store? 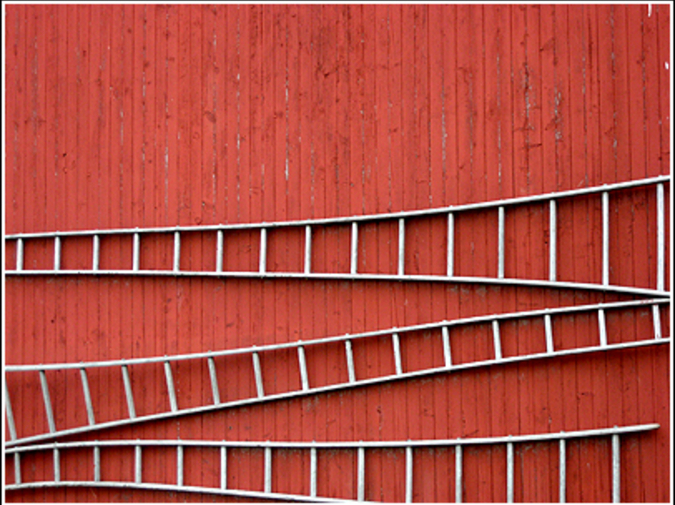 'Latter's Ladders'! The town's gone crazy!" I could tell father was angry, so I kept quiet. I, too, thought they were bad ideas and destined to fail, or maybe they were just pulling his leg. Why wasn't anyone going to open a grocery store? It was what we needed most, considering that we've had to run to the next town to buy our groceries at the Wal-Mart since Mark's Foods went out of business. While father was munching on his sandwich, I thought about Mr. Latter and his decision. Many years later – after father had passed on – Mr. Latter fell to his death from one of his highest ladders. They said he lost his footing and broke his neck when he hit the ground. By that time we'd received word from Florida that Jesse'd had a heart attack and died, too. I was forced to move when father passed because I couldn't afford to keep the house. I'd met Billy, a mechanic, while waitressing at a restaurant in a nearby town, and a few months after we'd hit it off, we decided to move in together. So I left my town to live with him in his. My town's mostly dead now, as are the people who used to inhabit it. The strip mall was a complete and utter failure that no one wanted to take a chance on again. Eventually it set there totally abandoned – soon after all the shops had folded, one by one. Maybe I couldn't have saved my town. Maybe I couldn't have saved my mother or father from lung cancer, but I could save Billy. Or at least I thought I would try. Jason Jordan is a writer from New Albany, Indiana, who always says he's from Louisville, Kentucky, because people actually know where that is. His fiction has appeared inThe2ndHand, Pequin, Pindeldyboz, VerbSap, Word Riot, and many other publications. Jordan is also Editor-in-Chief of the literary magazine decomP. He is currently in the MFA program at Chatham University, in Pittsburgh, Pennsylvania, where he is working on his first novel. You can visit him at poweringthedevilscircus.blogspot.com.